Happy One Year Book Birthday to Shadows of Myth and Legend! My collection of paranormal poetry Shadows of Myth and Legend released one year ago this month and I am celebrating with a giveaway. Shadows of Myth and Legend by E.J. Stevens. "Filled with poems about vampires, demons and other creatures of the night." "I just want to sit back and enjoy the flow of the words, the haunting world of myth and legend, of paranormal creatures and beasts of times long gone that Stevens has immortalized in the written word. And enjoy it I did." "The author has beautiful poetry featuring wolves, vampires, fae, gnomes, zombie's, unicorns, sirens, reapers and more. Each poem is wonderfully written and has a dark feel to each one." "I recommend this delectably dark book to every one!" "Each poem found within this book recounts a vivid story which at times can be dark, haunting, disturbing and yet beautiful in its own individual way." "Shadows of Myth and Legend is a lyrical and spooky collection that will appeal to anyone with a penchant for eerily beautiful things." "E.J. Stevens’ Shadows of Myth and Legend is a fascinating collection of short, powerful poems that thrill, chill and delight." 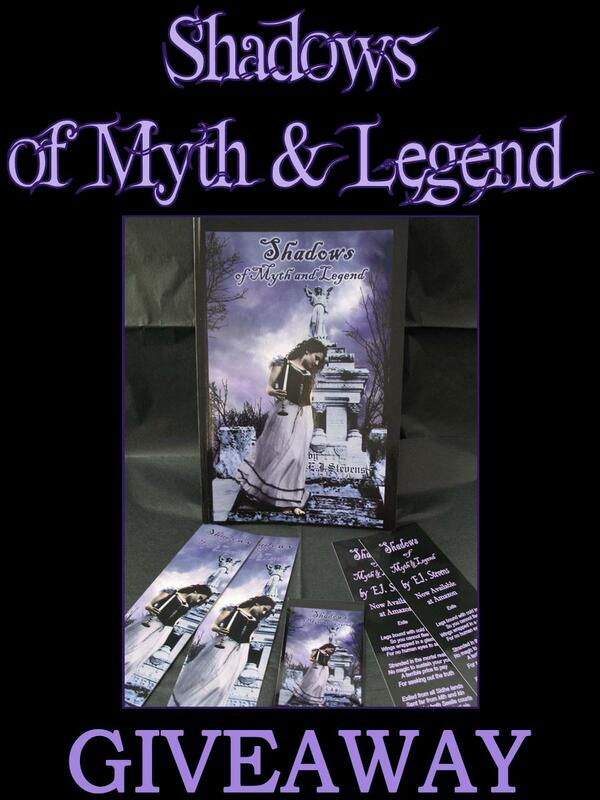 One US winner will receive a signed copy of Shadows of Myth and Legend a SoM+L magnet and bookmarks. One International winner will receive an ebook copy of Shadows of Myth and Legend . To enter, please leave a comment on this post including your email address (so we may contact you if you win). One prize pack is for US mailing addresses only and one prize is international (please see details above). Giveaway ends March 31st midnight EST. Wow, please enter me in! 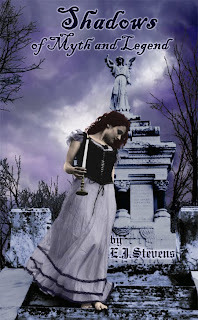 I always wanted to read Your poems which must be awesome for such and oldschool goth girl like me! Ive watned to read this one for a while.. thanks for the opportunity to win it! Congrats on the One Year Book Birthday ! Thanks for the opportunity to win. Awesome! Happy one year Book Birthday! Thank you for the Book Birthday wishes. It is hard to believe that my little paranormal poetry baby is one year old! Congrats on the one year anniversary! What a beautiful book cover. Congrats on the year! Please enter me in the giveaway. Congratulations!! It's so amazing that a year has passed!! Congrats on the year! Thanks for the giveaway! Happy Book Birthday!!!! Congrats on a great year for your baby! Happy one year book birthday! Thanks for the giveaway! Congratulations on the anniversary! The book looks great. Congratulations E.J. Thank you for giving me a chance to enter this great contest. Happy Book Birthday! Thanks for the contest. Happy One Year Book Birthday!! Great giveaway!! Definitely would love winning!! I've banned myself from buying any more books until I have read the ones I already have, ebooks and physical books. I just finished Spirit Guide 3 days ago and have been trying to talk myself into buying Shadows of Myth and Legend and some other books, arguing with myself that poems and short stories don't count in the ban, because I can read one poem/short story in between each book. Winning a book doesn't count as buying though, so count me in for the giveaway. (I'll probably talk myself into getting the books anyway). Wow I love the cover of this book! It is beautiful! The book sounds awesome too :D thanks for the chance to win this awesome stuff!!! Congratulations on Shadows of Myth & Legend's one year anniversary, E.J.! I wish you continued great success with this and all your wonderful books!! I'm interested! The colors really pops out!! I've been wanting to read this book but haven't been able to get it! yes!! count me in. You have the best giveaways =)Love your site and your cover art. Congrats on your one year book birthday E.J. Awesome, Happy One Year Book Brithday, and thanks for the giveaway! I'm in for the U.S. giveaway. Happy 1st anniversary and thank you so much for the giveaway! Happy Book Birthday! :) Thanks for the giveaway! Congrats on your 1 year book birthday! What a beautiful cover your book has! Awesome giveaway and Happy Birthday! Count me in :). I've read She Smells The Dead and would love to read more. Thanks for the giveaway! Happy Birthday. My hubby says I cannot purchase any more books until I read the stacks by my bed (I have 6 stacks that are just over 2 ft high ~ not joking either!). But winning a book is not like purchasing. I love short stories & poetry. Great to read on short trips or sitting in Dr offices! Congrats, and happy 1 yr anniversary. Happy 1st aniv! This looks like such a great book, thanks for the give away! Sounds interesing, and happy birthday, Sahdows of Myth and Legend!